The Borsmenta press club recently put 13 wines made from Villány’s favourite grape, Cabernet Franc, to the test, with some surprising results. Five were from its southern stronghold; however, the rest were selected from regions as varied as Szekszárd, Tolna, Balatonfelvidék, Balatonfüred-Csopak and Badacsony. The line up included a range of styles, ranging from bright, light and fruity to more oaky and dense. We even tasted an intriguing white Franc. The results were reassuring, yet also surprising, with Villány taking top place and joint second. However, the northern shore of the Balaton also turned up some real gems, scooping up joint second, fourth and fifth places. What’s more, number five is a real best buy, at just 3,000 HUF from Bortársaság! A rich, mouth-filling, structured wine with ripe tannins and plenty of bright acidity. A chalky note, a touch of green bell pepper and some tertiary character creeping in add complexity. Nicely integrated oak and a salty, mineral thread running through it keep it fresh right till the end of its long finish. An attractive cornucopia of raspberry and blue berries with a touch of green capsicum and violets. Crisp acidity and slightly grippy tannins but lovely varietal character. An appealing cool mineral streak balances the ripe fruit and the wines ends with a long, elegant finish. Beautiful ripe red and black fruit with redcurrants and cherry jam, maybe even a Mon Cheri chocolate or two. Lively, fresh acidity and fine ripe tannins give the wine a lovely framework, and it’s all freshened up by a cool, lean zip of minerals. A complex wine with fresh, ripe red fruit, including rosehip, cherry and crunchy plum. It’s showing some maturity with notes of tea and tobacco but also with a fresh zip of mineral, lime and green capsicum. Ripe on the palate with judicious oaking and smooth tannins. Balanced and long. A spicy blend of rosehip, redcurrants and sour cherries in cognac with a cool menthol note adding a breath of freshness and some complexity. There’s a pleasant green note and the tannins have a touch of grip. Bright crisp acidity and a long fresh finish. Prestige Reserve Club is an organisation devoted to supporting Hungarian wine and promoting its image. It not only confers awards to premium wines which represent outstanding quality on a semi-annual basis, but also supports other endeavours in the Hungarian wine world, such as wine events, restaurants, wine hotels, marketing initiatives and winemakers, giving awards in these areas. However, if there is a year where there is no deserving candidate for the award, then it will not be awarded. The award for wine marketing for 2016, which was first won by Kreinbacher for its introduction of sparkling wine, was scooped up this year by Balatoni Kör (Balaton Circle) and accepted by Bence Laposa. The Balatoni Kör was a small group of businesses which grew into a regional project with community products, a regional brand with its own design, labels and unique, homogenous image. Initially conceived by Bence Laposa, Gábor Kardos and Tamás Kovacs, Balaton Bor now consists of a complete quality classification for wines made from Olaszrizling from around the lake. The long-term plan is to offer an alternative to the state quality system. 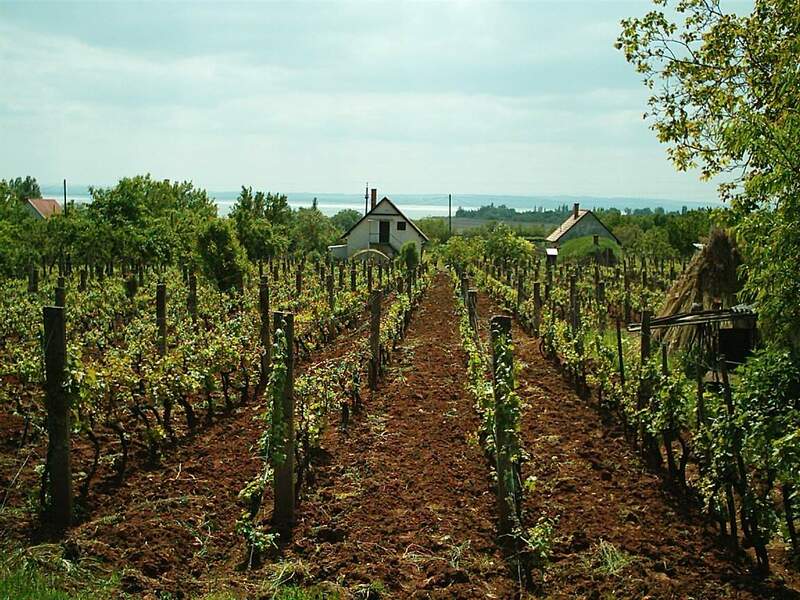 21 wineries qualified to make Balaton Bor this year. Indeed, it is already seen as a brand, guaranteeing the quality of basic wine. The example was given of a consumer simply asking for a glass of Olaszrizling as Balaton Bor in a restaurant without even mentioning the winery or variety, thus already showing respect for the brand. The Wine Event award was picked up by Borjour Magnum. Borjour, a youthful organisation, brainchild of Sebestyen Nagy, Gábor Toth and Sara Megyeri, which just grew and grew. The event, held each February, now attracts around 2000 visitors. Size matters here, as they also organise smaller events throughout they year entitled mini, classic and extra. They have been operating now for ten years to positive feedback from consumers and wineries, but to date had won no awards, so were delighted to have their success recognised by this award, say Gábor Toth, who picked up the prize. Bock Hermitage in Villány won the Wine Hotel award. This hotel, winery and restaurant offers its guests affordable, good quality rooms and meals in a pleasant, intimate atmosphere. The hotel is also active with events, e.g. the Villány Franc conference held in November. The Wine Restaurant award was won by the St Andrea Wine and Gourmet Bar in Budapest. This is an award for a restaurant which concentrates not only on the food, but also on what wines are on offer, whether the staff are knowledgeable about wine and combines this with fine dining. St Andrea Wine and Gourmet Bar is personal and thoughtful dining experience offering ‘Hungarian flavours open to the world’. It is, of course, connected to the Eger St Andrea Winery. The Hedonist award went to Péter Fritt of Best of Budapest. Presumably related to how much me has had to consume, in both food and wine, to assess restaurants over the last 22 years. His award was a glass so big that it has capacity for three bottles of wine! The Winery award went to Tokaj’s Disznókő. This is a clear and objective assessment of the quality of the winery and its wine; it is foreign-owned, so in this case, there can be no subjective association with a ‘figurehead personality’. Many winemakers have worked here, so there is no tight association with one particular winemaker; indeed teamwork is extremely important at Disznókő. There were many who believed that they would never be successful with such a name – Disznókő means ‘pig stone’ in Hungarian. However, they have been proved wrong, even taking risks such as selling an Aszú which could not be sold as an Aszú as is it didn’t meet the requirements, so confident were they in the quality of their wines. For them, Aszú is king, as this is why Tokaj has been famous for many centuries. Kéknyelű is a relatively rare white variety which grows only in Hungary, principally on the volcanic soils of Badacsony on the northern shore of Lake Balaton and in the Balaton Felvidék, although there are some plantings in Etyek-Buda, Zala and Kunság. Once widely planted, indeed it was once one of the most widely planted Hungarian varieties, much of it was grubbed up in the seventies in favour of more productive and reliable international varieties. At the end of the twentieth century, there were approximately 40ha remaining in Badacsony, although there have been some new plantings of the variety recently. It is named after its bluish stalks. It was for a long time assumed to be the same as the Picolit variety found in Friuli-Venezia-Giulia, however this was disproved in 2006 as a result of isoenzyme and microsatellite tests. It is not the easiest of varieties to grow and is cultivated in the ancient style with separate rows of both male and female grapevines; it needs its male counterpart, Budai Zöld, in order to pollinate as it only has female flowers. Then the wind is relied upon for pollination to ensure proper yields. It is thick-skinned, with small to medium-sized berries and relatively small clusters. It is susceptible to frost, but tolerates drought well, and thanks to its thick skins, doesn’t succumb easily to rot. It is late maturing and is generally harvested early to mid-October. In the past its relatively low yields led to local peasants calling it the ‘Gentleman’s grape’, as this meant it was rather expensive. Despite this, it was popular before phylloxera, although it was then eclipsed after WWII by high-yield varieties. The variety responds well to both reductive and oxidative wine-making. It can be rustic and simple, but when well made, it is a unique, exciting, aromatic variety. The wine has a pale lemon colour and can yield a savoury, smoky wine with hints of gunpowder, lemon, stone fruits, white blossom and herbs. It is generally full to medium bodied, with high acidity and high alcohol and demonstrates well the minerality of Badacsony’s characteristic basalt terroir. It is a heady, perfumed and refined wine, which shines with a sense of place. It can be drunk young but thanks to its high acidity, it comes into its own after a few years, developing an attractive honeyed nuttiness with bottle age. Now, as many wine lovers are look for more interesting, unique wines, it is gaining in popularity again. It pairs well with grilled fish or goats cheese. The last masterclass of the day was related to Csopak, which is part of the Balatonfüred-Csopak wine district. This part of the wine district consists of the villages of Csopak, Paloznak, Lovas, Alsóörs and Felsőörs. In the past, the main grape varieties to be found around the Balaton were Szigeti (a.k.a. Furmint) and Kadarka. Sixty percent of plantings were black varieties, whereas nowadays white varieties dominate, although there is no one grape variety closely associated with any of the wine districts or indeed the Balaton wine region itself. Csopak is trying to change this; in fact, it has long been associated with Olaszrizling and in an attempt to create a clear identity for itself, in 2012 it created something called the Csopaki Kódex (Csopak Codex) and the first year when it was applied to the wines was 2013. 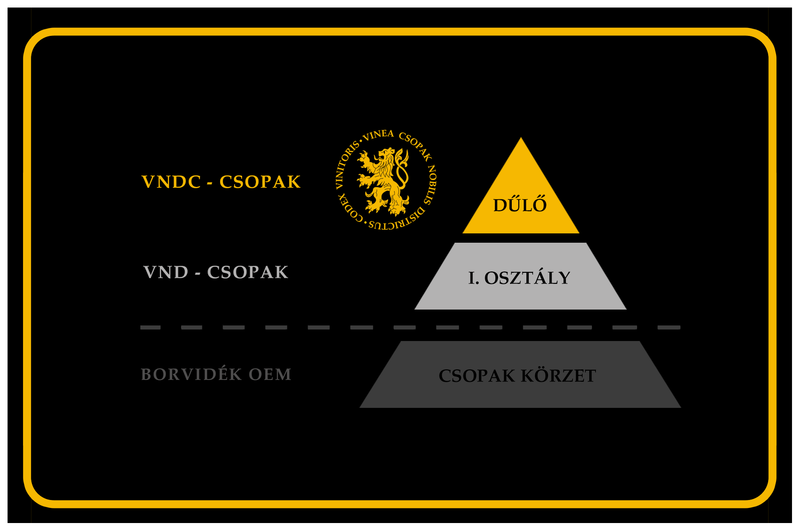 This is a kind of ‘quality pyramid’ for wines produced in any vineyards of the five villages which make up Csopak. The wine must be dry Olaszrizling and it must meet certain criteria in order to be able to display the Csopaki Kódex label. The Kódex is a three-level pyramid. The lowest level is Csopak Körzet, which is generic wine from Csopak, so a kind of ‘Csopak villages’ – wine can come from any of the five villages. The next level up is VND Csopak ‘premier cru’ – here the wine has to come from 26 ‘premier cru’ vineyard areas (dülő). The top level is VNDC Csopak where the wine is then vineyard selected. In order to qualify for the Kódex, the wines have to meet certain criteria relating to yields, residual sugar, filtering, acidity, aroma profile and alcohol level (12-13%). It should also have been aged at least six months in oak/tank and three in bottle. The wine should be bottled in Burgundy style bottles, closed with a quality cork and black capsule, and bear the Kódex sticker. The aroma profile of the wines should feature almond and rhubarb and mineral notes from the soils, which in Csopak are dolomite, marl and red sandstone. Since 2013, the number of registered growers has risen from eleven to fourteen. We got to taste wines from the following registered vineyards: Szent Donát Birtok, Petrányi Pince, Guden Birtok, Koralevits Pince, Jásdi Pince and Fekete Pince.